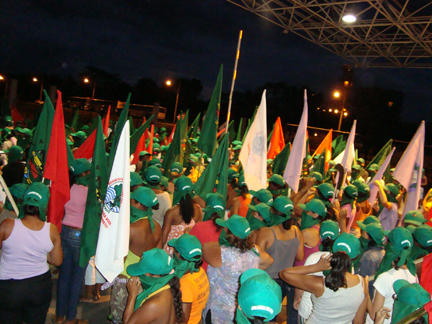 Women from La Via Campesina mobilized last week on March 8th for International Women’s Day. The fight is our historic tool to denounce the agribusiness model which is socially unjust and environmentally unsustainable. We also question the role of the State, which in the wake of a deep structural economic crisis, chooses to aid big private companies which exploit our country, its biodiversity, our natural resources and leave our workers unemployed. We live in a period where there is a new right-wing offensive against social movements. With this campaign, we show the enemies of Agrarian Reform and of the worker, that we will continue confronting agribusiness, creating an alternative project for the Brazilian countryside. While factory farms receive R$65 billion in financing from the government, family farmers, which generate jobs and produce food for the people, are left with less than R$13 billion. In 2008, BNDES gave to various sectors, including mining, stockbreeding, cellulose and paper, nearly R$17 billion. In the wake of the crisis, these sectors were the first to throw their negative effects onto the backs of workers: firms tied to agribusiness left 134,000 people unemployed in the country. It was the second highest sector of unemployment since September, when the international economic crisis began. We won’t pay for the crisis! We denounce monocultural production, and for that reason we occupy sugar cane and eucalyptus plantations. Those crops advance over food production and damage our biodiversity. For that reason we occupied the Cosan power plant in São Paulo, a Votorantim farm in Rio Grande do Sul, a Vale eucalyptus farm in Maranhão, we cut stalks of sugar cane in Paraíba, and planted beans and corn in their place. 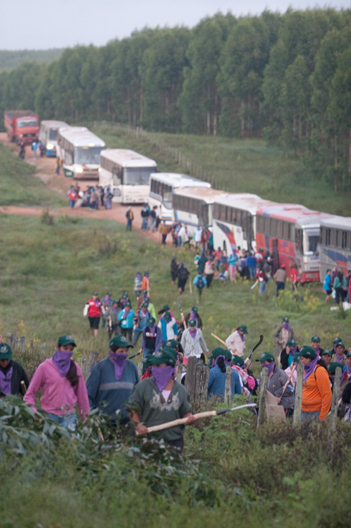 We denounce dangerous working conditions that lead to slave-like exploitation, and for that reason we occupied sugar plantations in Pernambuco and marched in Paraná. We denounce the project calling for the transfer of the São Francisco River and we occupied Codevasf in Pernambuco. We denounce the agro export model, which prioritizes the profits made by large companies. We occupied Portocel port, used and operated by Aracruz Cellulose, in Espírito Santo state, questioning the exportation of 96% of disposable paper from its production to consumers in the north. We questioned the agribusiness model and its financing of the State. The alliance between large property owners and transnational corporations has been deemed legitimate by the government, which doesn’t prioritize the family farmer. In Brasília we occupied the Agricultural Ministry, we occupied Incra offices in Rio Grande do Norte and in Paraíba. We occupied the Banco do Brasil agency in Santa Catarina. We protested in front of the Federal Supreme Court, whose president, Gilmar Mendes, has assumed the role as a leader of the right in Brazil. He defends his interests as a large property owner and the interests of his social caste. He doesn’t want Agrarian Reform or to see land redistributed. We will continue with our promise and remain mobilized and we won’t waver against those most reactionary sectors, the transnational corporations and financial capital. And while land, water and seeds are threatened, we will be ready. We are the progeny of so many men and women who did not submit to inequality and injustice. We have a plan for Brazilian agriculture, with its base being food sovereignty, family agriculture and Agrarian Reform, to address the necessities of the Brazilian people. At this moment, we place ourselves at the side of Brazilian society to discuss how to confront the economic crisis and construct a popular development plan, with social justice and popular sovereignty.